In today’s fast-paced education landscape, the Four C’s of learning – critical thinking, collaboration, creativity and communication – are seen as critical to preparing students for the workplaces they’ll enter when they leave school. To Miranda Public School principal, Glen Carter, Film By compasses all of these areas into one powerful project. Film By, previously Film By The Sea, is an initiative by a small band of dedicated teachers who firmly believe in the positive educational benefits gained from teaching film and film studies. Carter said this decision to change the project’s name to Film By was made in line with the aim of helping schools contextualize and tailor their own projects. 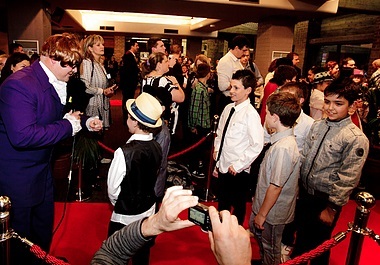 “We’ve got a festival starting in Ingleburn calling itself ‘Film by the Fields’, as in Macquarie Fields. There is another festival on the south coast involves schools in the bay areas, and they call their project ‘Film by the Bay’,” Carter told The Educator. Carter said the project’s new model means that instead of having one festival at one location at a time, the new model sees festivals take place in all regions across NSW over a two-week period. “This year, we have more than 10 festivals running. We have a festival in Sutherland, Bankstown, Randwick, Ingleburn, Huskisson, Scotts Head, Port Macquarie, the Blue Mountains and one that may be starting in Wollongong,” Carter said. Carter said Film By is also talking to School of the Air, which caters predominately for the geographically isolated students. “We’re looking at the possibility of a virtual festival due to the remote location in which the kids live. One option is having a Google Docs festival that the students can participate in,” he said. Carter said that one reason the project is so popular is because principals recognise the benefits of expanding students’ creative horizons. “People are starting to understand that we need to move forward in education and that 21st Century learning is the buzz word,” Cater said. Carter said Film By is a way of streamlining the curriculum, which many have criticized as too crowded. “Principals and teachers really want to know about this. Kids are already making films. Every phone is a camera which kids are using. We want them to do it the right way and tell a compelling story,” Carter said.